Philofaxy Web Finds is a great feature. Recently, we learned how Steve manages to put the web finds together. There’s quite a science to it! Come Saturdays, and now mid-week as well, readers across the world sit down with their cup of coffee/tea and settle in for a relaxing reading of posts and a viewing of videos of all things Filofax. Readers read each post, one by one, savoring all of the planner goodness. I don’t do this. Yes, you read that right—I do not sit down to read all of the Philofaxy Web Finds posts (gasp!). Rather, I use the list as an organizational tool to update my Favorite Places links, my Google Reader feeds, and to catch up on any posts created on new blogs. Normally, when new posts appear in Google Reader, I browse through the list and star (save) anything that appeals to me. For the most part, I save anything that is Filofax/planner/productivity related. For anything else, I save only those posts that appeal to me (for whatever reason). I apologize for this, because here I’m admitting that I don’t read every post that is published on every blog. I just can’t. There are so many wonderful blogs out there and I would love to read every post from every one. But the reality is that there just isn’t enough time (I barely have the time to keep up with the posts that I want to get to). I do have a few “favorite” blogs—they aren’t my favorites because they are necessarily better than others, rather they are favorites because I have read them from their inception (back when there were only a few Filofax-related blogs) and I have so much emotion invested in them that I just can’t skip any posts. And of course, I never skip a Philofaxy post. A few times a day I’ll open up Google Reader and save anything that I want to read later. When I have time (usually on my lunch break), I’ll read through my saved posts. Philofaxy items are always read first, mainly because by the time I get to them, my friends in Europe and beyond have already read the post and commented. If the opportunity presents itself, I want to be able to comment before everyone has moved on to the next post. From there, I usually head to the oldest post first and continue up the list until I run out of time. The process then starts again when I have time. Using the various Gmail stars, I know what needs to be answered (red exclamation point) versus looked at (orange arrows) versus updated (yellow exclamation point). When I get time (usually later that evening or the next morning while I have coffee) I will post my comment, subscribe to the post via email for any follow-up comments that may appear, and then delete the email once I’ve done so. This way, I rid my inbox of virtual clutter. It may take me a long time to get through my list, and while I would love to be able to get completely caught up from time to time, I know that it’s not realistic—I very rarely get caught up, and even when I do, it’s only a few hours before my list starts growing again. When I know I will be travelling, I will save any unread articles to the Instapaper iPad app. This app allows you to save an article or blog post so that you can read it off-line at a later time. Since I don’t have wireless for my iPad on the go, this comes in handy. And when I’ll be travelling for a few hours, it allows me to catch up on all those unread blog posts. I have a folder where I keep anything I want to comment on, and when I have wifi again, I will do so. With Web Finds, however, the process is different. As soon as I see the post, I email it to myself. When I have time, I go through the web finds posts and pick out any blog that is currently not on my list (lately there are usually three of four each week). I don’t read the highlighted post. 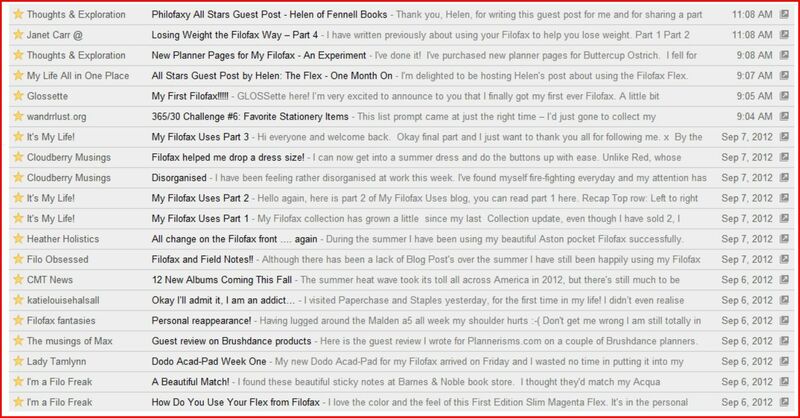 Rather, I look at the entire blog to determine if it really is (for the most part) Filofax or planner or organization related, or if the main purpose of the blog is something else entirely that just happened to have a post or two on those subjects. If it is indeed a related blog, I add it to both Google Reader and my Favorite Places list on my blog. If not, I won’t do anything with it at that point (sometimes a blog will reappear in Web Finds because more and more posts are subject related—at that point, I will add the blog to both places). If and when a blog gets added to Google Reader, the last 10 posts will appear as unread. I will go through and save anything that catches my fancy. So eventually the post that was originally highlighted in Web Finds will be read. From there, all future posts will be part of the blog post saving/reading system as described above. After I have added the new blogs to my lists, I go back to the Web Finds post and watch the videos. Getting through them all may take a day or two, and if they’re longer than 5 minutes, I often skip through so that I can get a taste for the entire video rather than only being able to watch the first 5 minutes—I hate to stop mid-video. Since so many blogs get started and fizzle out after a while, I do need to weed through my list every now and then. Currently this is done on an annual basis. Every year (usually at the start of the year), I will go through the Favorite Places list on my blog. I will look at each and every blog (skipping those I know update frequently) and remove any that have been shut down or have not posted within the last year. Yes, I may remove blogs that have relevant content, but chances are, if they haven’t been updated in a year, it’s pretty much a dead blog. This wouldn’t matter so much if there weren’t so many blogs to begin with. But seeing as I’m adding to the list every week, I need a system for weeding out old content, as good as it may be. And since the Favorite Places list corresponds to what I subscribe to via Google Reader, this weeding process also allows me to unsubscribe from dead blogs, keeping my Reader list to only relevant blogs. Again, it’s ridding myself of electronic clutter, which to me, is just as important as ridding myself of physical clutter—if I don’t see it, I don’t have to think about it, allowing me to eliminate it from my mind so that I can concentrate on more important (and active) things. I hope I have described my Web Finds and general blog reading system without causing too much confusion. Please let me know if you have questions regarding my Web Finds process. Thank you to Steve for hosting my babbling guest post!